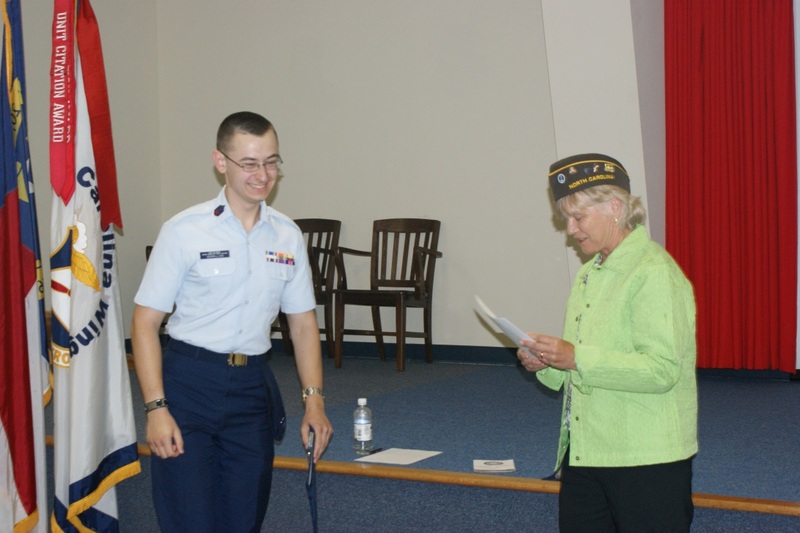 Tuesday, May 16, 2014, two cadets from the Burlington Composite Squadron were honored in a ceremony at the Civil Air Patrol North Carolina Wing headquarters on Alamance Road in Burlington. Sue Lamm-Gurley, Commander of the Burlington VFW Post 10607, presented the VFW meritorious awards for cadets to Cadet Senior Master Sergeant David Vermillion who received his unit’s outstanding cadet NCO of the year award and to Cadet Lieutenant Colonel Rachael Bailey who received her unit’s outstanding cadet officer of the year award. The Burlington Composite Squadron is a unit of the North Carolina Wing of the Civil Air Patrol. There are forty units in the North Carolina Wing. The Civil Air Patrol is an all-volunteer civilian auxiliary of the U.S. Air Force which is involved in search and rescue among other duties. There are fifty one cadets in the Burlington unit and thirty senior members. The Burlington Squadron is one of the largest units in the state.